What are the school’s achievement priorities? Where does more able achievement appear? Where do you fit? 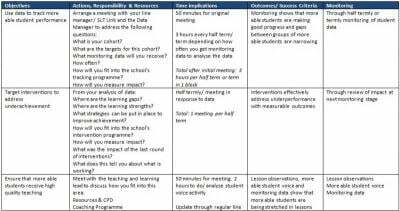 Is it your role to track more able pupils or will someone else give you this information? Identify your focus and your cohort from the start. You need to work as part of a bigger team focusing strategically on improving achievement. pupils who are making better than expected progress – how can good practice be shared? pupils who are making less than expected progress – what strategies need to be put in place to address this? trends across key groups – are disadvantaged pupils making as much progress as non-disadvantaged pupils for example? Make sure that you're aware of key subgroups such as gender, disadvantage and ethnicity. Clarify responsibilities: look at more able data yourself – but remember to draw on your line manager, senior leadership team link or data manager too. Reflect: For all your data tracking you need to be asking: Why is this happening? Where is this happening? What characteristics do these pupils have? What strategies could improve achievement and how will you measure their impact? What are the strengths to celebrate and the learning gaps to plug? Go to your line manager or SLT link to discuss strategies, remembering that Ofsted recommend regular measurement of interventions to ensure impact and correct focus. Be clear that you are part of the wider intervention team and clarify your responsibilities. Remember: You are not alone. Your line manager or SLT link will be experienced in identifying improvement strategies. Use the expertise of those tracking pupil premium pupils to adopt best practice quickly. How do more able pupils fit into school plans for improving teaching and learning? What practice can be shared and how can teaching be supported in weaker areas? High quality teaching means successful outcomes. Be familiar with the ingredients of a stretch and challenge lesson: Lesson Ingredients for Learning is a straightforward and up-to-date guide. Use your school’s teaching and learning lead. Discuss possible strategies after you’ve seen pupil data, so you can focus on strengths and weaknesses in more able achievement. Consider pupil voice to find out from more able pupils about what is helping them to learn effectively, involving teachers and departments in the consultation process. Improve: Share best practice resources to encourage high quality teaching - consider implementing an open classroom policy. Does the school currently emphasise the importance of independent, curious and engaged learners? Are pupils adopting fixed mindsets about achievement? If you are a form tutor, suggest that you use this time instead to work with more able pupils. This will allow you to lead assemblies and introduce new concepts. Use learning contracts, School Up or independent skills learning logs to encourage pupils to monitor their own learning, enhancing their skills and saving you time. Conceptualise: Assemblies are an excellent way to build in learner CPD. Introduce your pupils to SOLO Taxonomy’s extended abstract thinking or give them a ‘Failing to Succeed’ assembly on the importance of making mistakes. What enrichment activities are available for more able pupils? Do you use enrichment weeks? Can you organise activities that enhance and extend your more able community, perhaps partnering with other schools? Once again, don't do everything personally but simply draw together what is available for more able pupils. initiatives like Speakers for Schools. Use pupil voice to map enrichment to existing activities, like school magazines, and consider what extra ones could be offered. Provide: Use school resources to further learning: perhaps providing books and journals for more able pupils or working with departments to provide reading recommendations. The role of gifted and talented coordinator is a fulfilling one that gives you the scope to get involved in a number of different areas of school life. By planning your time sensibly and linking up your practice with others in the school you will be able to have an impact on the achievement, ambition and experiences of your more able pupils. Good luck! How do you create a culture of consistently high expectations in the classroom?